To monitor traffic and resources on your Windows Server, you must access the management of your machine by Terminal Server and with the right mouse click, click Start Task Manager. A couple of days ago we gave you some tips and applications so that you would be able to constantly monitor the performance of your windows computers or dedicated windows servers. In this way you would be able to know at any moment what is the process that is causing your computer to suddenly start Go unusually slow or hang suddenly. But this is not a problem unique to Mac or Windows much less. Windows also crashes, and for that reason we have thought that more than one could be useful a small similar tutorial. That is precisely what we are going to do today, explain how to monitor the performance of Windows 10 using system tools or other third-party applications. 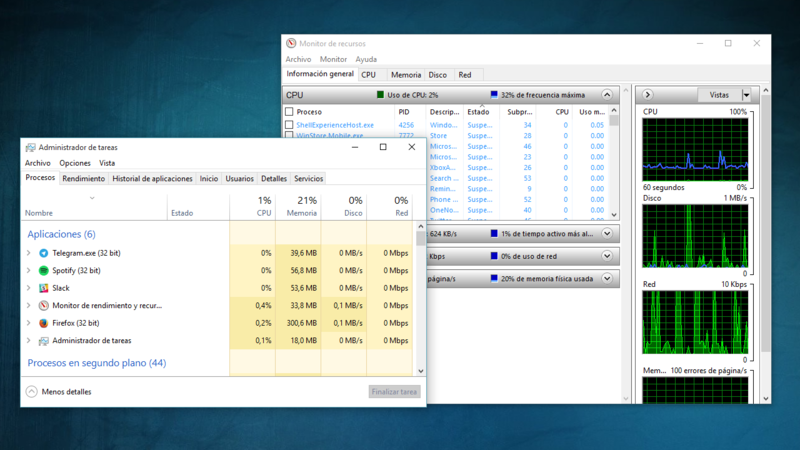 Windows has a native task manager that will help us know what applications we have running and how much they consume. To access it you only have to write Task Manager in Cortana or choose it in the menu that will appear after using the classic key combination Ctrl + Alt + Delete or simply press Ctrl + Shift + Esc to go there directly. As you will see, this administrator will show us information in several tabs. The main one is the one of processes in execution, which indicates the percentage of CPU, RAM, hard disk and network that is using each one of the running applications, being able to order them at all times according to these parameters. The rest of the tabs display the performance history of the applications, which are executed when the computer is started or which users consume the most. We also have another in which we will see the overall performance of the system, and if you do not convince us in it we will have a direct access to a much more complete Resource Monitor application. Although the native Windows application is quite complete, especially to know what applications are consuming us resources, if we want to expand the information on the overall performance of the system we can do so by resorting to third-party applications. There are many, so surely in the comments you can propose your favorites. One of my favorites for the large amount of information on my system that I offer is CPU-Z. This tool does not serve to know what applications are consuming memory, but with it we can have all the data of the components of our computer, as well as the status in real time of its operation. SpeedFan is another essential application for those who want to have total control of their system. With it we can not only read the temperature of our motherboard and hard drives or the voltage and speed of our fans, but we can change the speed of the latter and make it increase or decrease depending on the performance of the hardware.